When Snow White and the Huntsman became a moderate success back in 2012, giving stars Kristen Stewart and Chris Hemsworth a reasonable hit outside of their respective Twilight and Avengers franchises, a sequel was naturally beginning to come together – but then, certain leaked connections between Stewart and the first film’s director Rupert Sanders quickly changed direction toward a spin-off revolving around Hemsworth’s character instead (that’s the unfortunate power of tabloid media, ruinous when in the wrong hands). Stewart’s Snow White is only referred to by name in the resulting follow-up that is The Huntsman: Winter’s War, and while it’s a bit of a shame she wasn’t even brought back for a quick cameo to establish continuity – it’s worth nothing that in her place in scenes she was clearly written into before obvious post-scandal rewrites is on-screen love interest Sam Claflin, who by the way he acts here probably doesn’t even remember he was in the last film – the film itself is, much like the previous one, perfectly moderate enough to pass as throwaway fantasy entertainment. Two-thirds of the film is actually a sequel taking place after the events of Snow White and the Huntsman, while the first third is a straightforward Liam Neeson-narrated prequel that details how Hemsworth’s Eric became a Huntsman in the first place. As it turns out, he and a group of captured children, among them a warrior named Sara (Jessica Chastain), were raised and trained by the Ice Queen Freya (Emily Blunt) in her snowy fortress, formed after a tragic death caused her to, erm, “let it go” and reign with an equally-icy heart, forbidding love in any form. Naturally, Eric and Sara end up defying that rule, and what happens next leads more or less into where we meet Eric in the first film. One time-jumping edit later and we’re now where we left off before (we personally can’t wait for the fan edit that splices that film in between the first and second act of this film), when Eric is sent on a mission with two dwarves (Nick Frost and Rob Brydon) to retrieve the fatal Magic Mirror from Freya’s grasp, as it not only contains enough power for her to take over the kingdom, but also might summon the return of her sister, the evil Queen Ravenna (Charlize Theron). Sanders is replaced as director by first-time helmer Cedric Nicolas-Troyan, who was part of the Oscar-nominated visual effects team of the first film, and while that would usually be a cause for alarm when an inexperienced craftsman is suddenly named director of a major film (see also: cinematographer Wally Pfister directing Transcendence, and art director Robert Stromberg with Maleficent), this is honestly one of the more enjoyable instances, because Nicolas-Troyan has actually had the decency to make something far more entertaining than it has any right to be. Whereas the first film was more of a revisionist fairy tale with more sword-fighting than singing, this one is much more of an action-adventure film, in the vein of Conan the Barbarian or even Raiders of the Lost Ark, with Nicolas-Troyan staging fight scenes and big set-pieces that seem like a loving throwback to that style of movie-making. There are also several surprising instances where practical sets are favoured over computer-generated ones, from rickety bridges over lakes of gold to gothic interiors of villains’ castles, which are welcome in a film that could have so easily done a 300 and have everyone act off a blue-screen in a studio (well, not ALL the time, anyway). The fact that they are actually there with the actors also helps to re-enforce the feel of the classic adventure flick and not just some hollow CG-laden clone, and while the CG itself is admittedly not up to par with how it was in the first film it still does the job well enough to at least look nice and fun enough for the audience to enjoy. Cast both old and new work fine with what they’re given; Hemsworth is on heavily charismatic form here, incomprehensible Scottish accent aside (something not helped by Chastain’s own equally hard-to-understand dialect), while fellow returnee Theron relishes in what little screen-time she has to be as campy and over-the-top as anything you’d find on Once Upon A Time; however, it’s the newer faces that shine brighter like Blunt’s tragic figure of an Ice Queen and Sheridan Smith as a scene-stealing female dwarf (can the next spin-off just be about her, please? ), both of whom manage to fit well into this heightened fairy tale world around them. However, not even they can entirely make up for its more obvious faults, like a script that unapologetically borrows elements from more successful products like Frozen, Willow and anything Tolkien-related and try to pass it off as its own, albeit on a less convincing level, or the lack of true suspense when it’s easy to predict almost every outcome this film considers to be actually shocking (a late reveal of the true mastermind behind the incident that led to Freya’s misery will come as a surprise to absolutely nobody). Even so, we’re glad that at the very least they tried to make something that audiences can genuinely consider fun, even if it’s not the most well-thought-out of the bunch, and as a result The Huntsman: Winter’s War can easily go hand in hand with its predecessor as yet another fairly enjoyable fantasy that we’ll probably soon forget about a few months later. 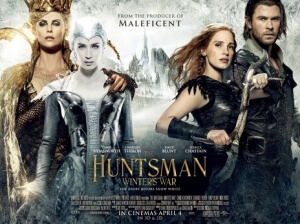 The Huntsman: Winter’s War has more than a few moments of genuinely entertaining fantasy-adventure beats, among them practical sets and a charismatic lead, but they serve an unoriginal and sometimes uninspired script that ultimately has no purpose other than to make a quick buck in the wake of other fantasy properties this desperately wants to be.